In another sector of the internet this week, a mobile game called Pokémon Go was released. Being of the geekish human variety, I was inexplicably excited about this game. They were giving me a chance to catch ’em all once again, this time in the real world using an obvious combination of technology and magic. I downloaded it immediately when I saw the news of its release. Even in the wake of such sadness, the iconic theme music started and it was impossible for me to prevent the delighted grin from taking over my face. As I was introduced to Professor Willow, who tasked me with assisting him with his research by catching as many Pokémon that I could, I giggled like a middle school girl being approached by her secret crush on the schoolyard. After capturing my first Pokémon, I started taking notes on the interface and how the game would work. It seemed straightforward enough. Using GPS, my avatar marks my position on a simplified version of what is essentially Google Maps. Little grass confetti animations show me where Pokémon might be located nearby. Seems reasonable that I should walk there and potentially this would allow me to catch one. I see a few that seem to be located in my apartment complex, but unfortunately it’s getting late (around 10:30 pm) and I have a good ole’ American nine-to-five job. Like a normal adult, I started up my computer, played a couple hours of Overwatch, poked around on Facebook for another hour while in bed, then went to sleep. Early the next morning, shortly after my partner left for work, I couldn’t help but to give Pokémon Go another shot. I had about an hour before I needed to be at work so this seemed like the perfect opportunity. I threw some clothes on, fired up the app, and set out for an adventure. 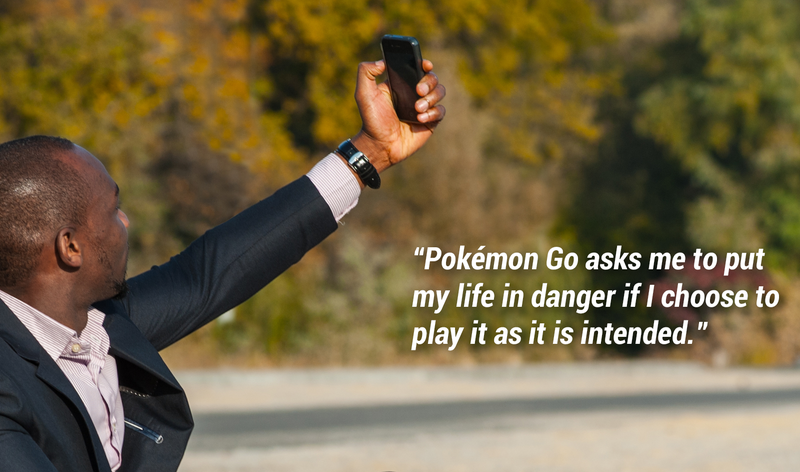 When my brain started combining the complexity of being Black in America with the real world proposal of wandering and exploration that is designed into the gamplay of Pokémon Go, there was only one conclusion. I might die if I keep playing. The premise of Pokémon Go asks me to put my life in danger if I choose to play it as it is intended and with enthusiasm. Let’s just go ahead and add Pokémon Go to the extremely long list of things white people can do without fear of being killed, while Black people have to realistically be wary. Honestly, I wish this was a joke post or satire of some sort. It isn’t. Something needs to change. This article originally appeared on Medium. Republished with permission. Omari Akil is a North Carolina-based writer.